A different vote would have complicated things for many years ahead and would not have helped Israel. 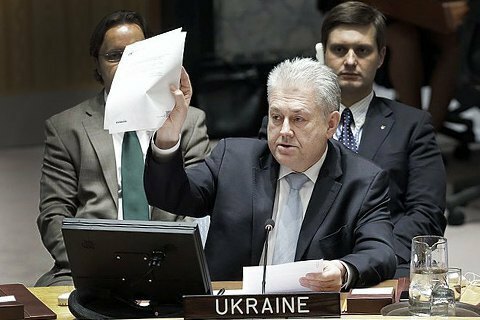 Ukraine's position during the voting on the UN resolution demanding the halt of settlement activity by Israel on occupied Palestinian territory was correct, Ukraine's permanent representative at the UN, Volodymyr Yelchenko, has said in an exclusive interview with LB.ua. "I am further convinced that our decision was correct. There were many emotions around the issue. People used to say that the USSR was good in two things – football and agriculture: what and how to plant and who the attackers in Dynamo Kyiv should be. Now everyone is an expert in Israel. I would suggest one read and analyse the resolution first," he said. In his opinion, the majority of critics did not do this before they started yelling that "Ukraine has betrayed Israel". "First, it is absolutely not so. Second, why does no-one run and cry that Great Britain has betrayed Israel? Or France? Why Ukraine? We voted on similar resolutions in the UN General Assembly dozens of times and even in the Security Council during our previous membership in 2000-2001, but never dit it cause any irritation on such a scale," Yelchenko said. Asked by LB.ua if Ukraine could abstain, Yelchenko said "our abstention on this resolution on Israel would not have helped anything". "But it would have complicated things for many years ahead. And not only in relations with Arabic countries. I would like to remind you that just like Israel, some of them supported our resolution on Crimea. And this must be appreciated too. Second, there is also the Islamic world – so how would we have approached and asked them for support on Crimea or Donbas had we abstained (there are over 50 of them)? After all, we don't know how it is going to be tomorrow or in a year. And we need broad support," he said. "So I would wish all our experts had better analysed the Crimean resolution, not the Israeli one," he added. He said that the Middle East situation, including the Palestine issue, would be discussed in closed consultations on 14 February. In late December 2016, Israeli Prime Minister and Foreign Minister Benjamin Netanyahu cancelled Ukrainian Prime Minister Volodymyr Groysman's scheduled visit over Ukraine's vote in favour of the UN Security Council resolution on Israel.